Place tofu on paper towels, lay more paper towels over the tofu, and place a heavy object on top. Press tofu for an hour. In a small bowl, combine spices with water and lime juice. Set aside. In a medium pan, heat olive oil over medium heat. Add onion and pepper to pan and saute until softened. Move veggies over to one side of the pan. Crumble tofu into bowl with spices and toss to combine. Add to the pan and stir to cook. 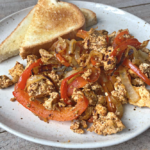 Once thoroughly cooked, stir tofu together with peppers and onions, and serve!